You might be tossing about in a sea of despair You might even feel as if your life may crash about you and you will never again be healed, whole or happy. They say Robert Louis Stevenson told the story first. It's worth retelling: It seems a storm caught a seafaring vessel off a rocky coast. 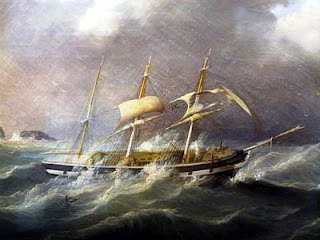 The wind and waves threatened to drive the boat to its destruction. In the midst of the terror, one daring pas­sen­ger, contrary to orders, made his way across the ship. Groping along a passageway, he found the pilot house. There he beheld an intriguing sight; the ship's pilot was lashed to his post. Secure against the raging elements, he held the wheel fast, turning the ship, inch by inch, once more out to sea. The pilot saw the watcher and smiled. The daring passenger found his way below deck where other passengers huddled. Encouragingly, he said, "I have seen the face of the pilot, and he smiled. All is well." There are times we need to hear that. Especially when we feel tossed about by a raging storm, it helps to remember that the pilot smiles. Dear Lord, we thank You that you are smiling, because You are in control. Help us remember when things look out of control that You are there. In Jesus’ Name, Amen.